Latisse is the first prescription solution to be approved by the FDA for growing long beautiful eyelashes. Latisse grows eyelashes longer and fuller in 12-16 weeks with visible results as early as 8 weeks. 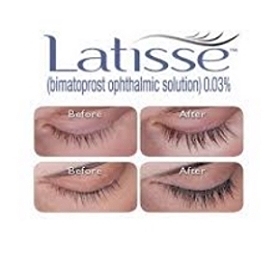 Latisse’s unique power to grow eyelashes comes from the active ingredient bimatoprost, which actually was developed to treat glaucoma and has the brand name Lumigan. When Lumigan hit the market, patients noticed their eyelashes were growing. In 2008 Allergan received FDA approval for bimatoprost to be marketed as Latisse, specifically to stimulate eyelash growth. Although the precise workings of bimatoprost on the eyelashes are currently not known, researchers believe that it stimulates more hairs into the active growth phase and increases the duration of this phase resulting in fuller and longer eyelashes. Latisse is applied one time per day. It is recommended that you do this as a part of your nighttime routine. If you forget a day, don’t worry and just start up again the next night. However, do not compensate for missed eyelash treatments by applying more solution. After the initial 16 week treatment, many Latisse users opt to apply every other day or a few times per week. If you stop using Latisse, eyelashes will eventually return to their previous condition over the coming weeks or months. You may continue to use mascara while using Latisse eyelash solution. Latisse is $168.50 for a 3 ml vial which will last you about two months. All applicator brushes included. Latisse is $218.50 for the 5 ml vial.